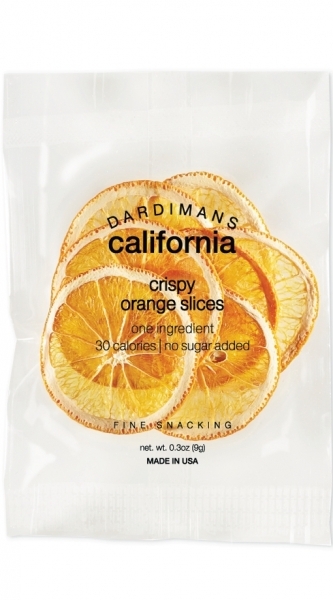 Our orange crisps is the product that started it all! Pairs perfectly with salsa, ceviche, salad, hummus, yogurt, acai bowls, black tea and beer. NUTRITION FACTS nutrition facts serv. size (9g), serving per bag (1), amount per serving: calories 30, fat cal. 0, total fat 0g (0% dv), sat. fat 0g (0% dv), trans fat 0g, cholest. 0mg (0% dv), sodium 0mg (0% dv), total carb. 7g (2% dv), fiber 2g (8% dv), sugars 6g, protein 1g, vitamin a (2% dv), vitamin c (10% dv), calcium (2% dv), iron (0% dv). percent daily values are based on a 2,000 calorie diet.